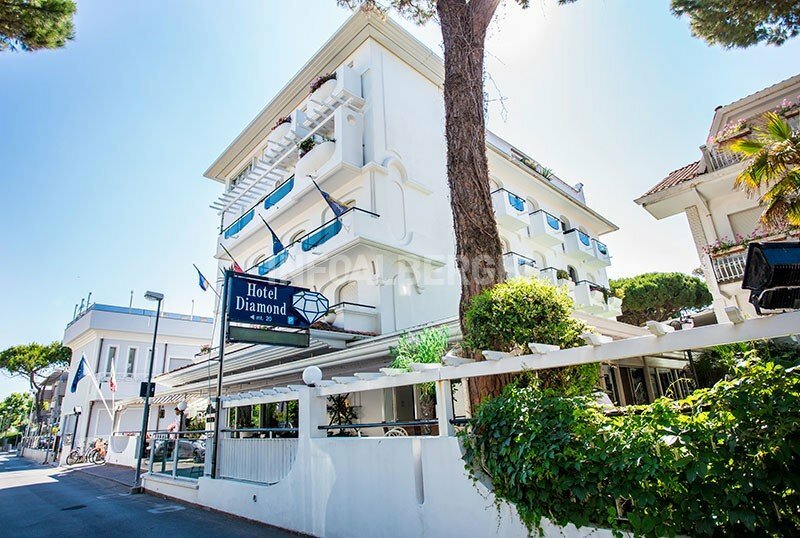 The Diamond Hotel , 4 stars in Riccione, is an ideal structure for the stay of families with children. Elegant and well furnished, it offers a rich entertainment program, theme nights for all ages, parking spaces in the garage, city bikes with a seat. Accept small animals. The hotel is located near the beach, which can be reached in a couple of minutes on foot. A 5-minute walk away are the Terme di Riccione and around 15 minutes walk are Viale Ceccarini and the Palacongressi. The rooms have a balcony, air conditioning, WI-FI, satellite TV and digital terrestrial LCD, safe, telephone, minibar, bathroom with shower, bathroom scales and hairdryer. SMART / BASIC : can accommodate 1/2 people. In formula "Basic" ideal for those who are passing and in freedom. In formula "Smart" for those who want to enjoy all the services of the hotel and Riccione. FAMILY SMART: they are ideal for families with a child. The rooms consist of a double bed and it is possible to add a camping cot or a single bed (1.30 m) for a child up to 6 years old. They are 15 square meters and have a bathroom with shower. FAMILY : can accommodate up to 4 people: double bed and a single bed or a bunk bed. 32 "LCD TV, electronic safe, minibar, courtesy set, personal scales, individually controlled air conditioning and heating, baby kits with changing table, baby bath, crib, bottle warmer and night light are available on request. up to 6 people. THEME FAMILY : "Diamantino il pinguino" and "Ulisse il delfino", two rooms dedicated to young guests. Like the family, the themed rooms are also double with a single bed or an added bunk bed. Baby kit with changing table, baby bath, cradle, bottle warmer and night light is available on request. FAMILY COMMUNICANTS : they offer all the services of the Family room and consist of a double and a single room with a bunk bed, or two single beds one in a row to the other. Baby kits are available on request with changing table, baby bath, cradle, bottle warmer and night light. Garden, open-air porch, free use of city bikes, hall with bar, reading room and lift, beach towel on request, laundry service. Theme nights are organized. PARKING : parking space in the garage, available for everyone. AIR CONDITIONING : in all environments at no additional cost. CONVENTIONS : beach, amusement parks, swimming pool, spa, shuttle (on request, 9 seats free for the airport and station), organized excursions. BREAKFAST : buffet-style in the garden, with sweet, savory and organic products including yogurt, different types of cereals, fresh and syruped fruit, croissants, brioche, white and wholemeal bread, biscuits, honey, jams, fruit juices, chocolate , coffee, tea, cold cuts and cheeses. On request: bacon, hard-boiled eggs, scrambled or fried. LUNCH AND DINNER : vegetable and antipasto buffet, 4 choice menus (served) with fish, meat, local and seasonal products, every day. The restaurant offers an extensive list of Italian, organic wines and beers. In hotel : bicycles with seat and helmet, pushchairs (not bookable), fenced outdoor playground area, indoor baby room from 1 to 3 years, library, play station, baby sitter with meals, entertainment, baby / mini / junior club, parties birthday, 2 TV with Playstation and DVD, baby bottle open 24 hours a day, afternoon snack, homage upon arrival, pediatric counseling. In the room : baby set up with cradle, baby bath, changing table, bottle warmer, fall protection rails and night lights. At meals : "Diamantino" restaurant with baby menu and assistance for 1-3 year olds, kitchenette equipped for preparing baby food, homogenized, bottle warmer. On the beach : playground, entertainment, mini club, weekly parties, nursery with changing table. The hotel has an agreement with the nearby Bagno n. 59, equipped with games for children, entertainment, hot tubs, hot and cold showers, nursery toilets, sports fields, cabins and relaxation area. Take advantage of the Riccione Hotel's Easter Offer! less than 5 minutes walk from the famous Viale Ceccarini! Rates starting from € 57.00 per person in double room with full board. Unique position, between the sea of ​​Riccione and the thermal baths, less than 5 minutes walk from the famous Viale Ceccarini. - Wi-Fi always free and unlimited. Promotion in B & B 1 adult + 1 child (0-11 years): € 58.00 per day. The rate varies depending on the age of the child stay min. 4 nights. Rates are variable and fluctuate depending on the period and occupation. Many advantages at a really affordable price in Riccione at the Diamond Hotel! You will find a pleasant surprise offered by the management "1 bottle of prosecco and a box of chocolates". Among the services, also a convenient garage / parking and Wi-Fi. Valid from € 32 in B & B. We can offer you a 20% discount for min. 7 nights on the best rate. Many services for children: play area, baby sitter, entertainment, surprise on arrival, snack and much more! Min stay 7 days: from € 45.00 per day in a double room, for 2 adults + 1 child in B & B. Active offers for full board, all inclusive and half board.